Last year, a buying guide was published for train sets and seeing as we are close to Christmas I thought it high time we update it with those in the 2013 ranges. The reviews are based on knowledge of the contents of the set’s and therefore we will not look at specific diesel or Thomas the Tank engine packs. There is a FAQ web page that goes over some of the basics of train sets, that will be worth reading if you are new to model railways. 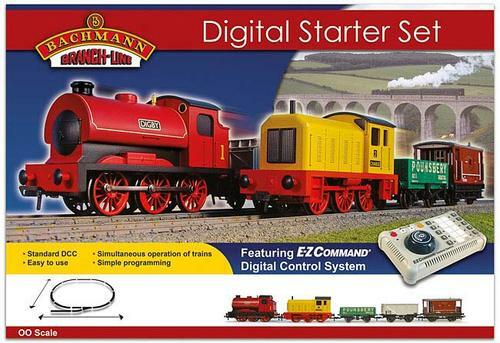 This is an excellent start into digital model railways for younger children and fairly good value considering you get a DCC controller and two locomotives. The two models run significantly better than Hornby 0-4-0’s and the set has real playability. The models are generic toy-like representations, so it is not suitable for older (12+) audiences. 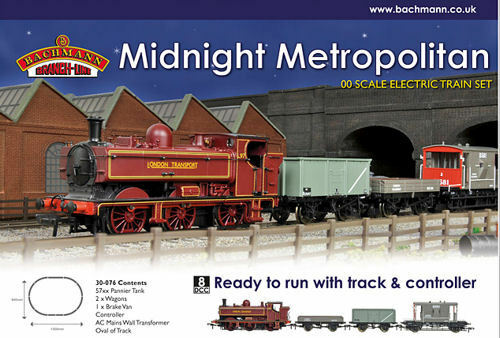 Discontinued in 2013, but sets are still available in some stockists (see below for replacement set). 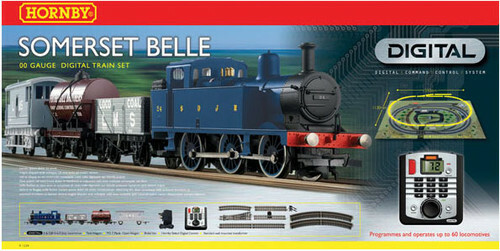 The 2013 replacement for 30-041, with the only being difference being generic locomotives and a higher RRP (£149.99). This set has a BR liveried 0-6-0ST and a GWR 0-4-0ST. This set is pretty much the same as R1167, but rather than The Flying Scotsman, you get the Mallard (a Railroad version). Although yet to be reviewed on locoyard, the Railroad A4 is a little better than the Railroad A1/A3. However, as it is new, it’s not easy to get it cheap – aim to spend no more than around £135 if you can. The Hornby generic 0-4-0 tank engine contained in this set is a very poor model, even when compared with other train set models. For this reason alone I wouldn’t recommend the set! The set is a little redeemed by a nice selection of basic wagons and lineside accessories. The rrp of £74.99 is too high; only consider purchasing if it’s at a bargain (sub £50) price. Only suitable for a younger audience. Discontinued in 2013, but sets are still available in some stockists. Bachmann train sets reviewed here are excellent. The fantastically liveried 57xx is a lovely, popular model. It’s a pity that Bachmann didn’t include a siding for this shunter, but overall it comes highly recommended. 30-076 and 30-077 have locomotives with different running numbers, but are essentially the same set. At first glance this looks like a good set, but be warned as it isn’t. The steam locomotive (Hornby J83) is one of the worst available on the generic 0-60 chassis, as is the very poor diesel class 08. The worst bit is the price tag – an RRP of £209.99 (almost £25 higher than last year!) is a serious amount of money for such poor models. Despite it’s appeal of being a DCC starter package, it is best avoided, unless you can find it for around £105. Although not nearly as nice as Bachmann’s version, the Hornby Jinty is adequate, especially for a younger audience. The SDJR Blue livery is surprisingly well applied on this model. 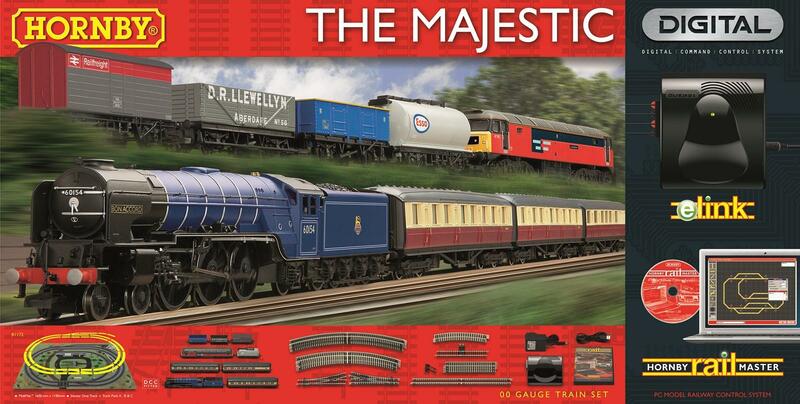 This set is a reasonably good package but completely outclassed by R1173, simply due to the different DCC systems. It is worth around £100 – for that price it is reasonable buy, but I’d opt for the more advanced R1173 The Western Master. This set and R1173 are somewhat revolutionary. Unlike other digital set’s, rather than coming with a basic controller, they come with Hornby’s new e-link device and with Railmaster software. This allows you to control your trains from a PC, or even use a smartphone. It is very clever and although I’ve yet to test it myself, the reviews I’ve read have been fairly positive. It gives you potential to give you far more control than a conventional standard DCC controller. Note that you need a PC to work this properly! So what of the set? Hornby’s A1 class locomotive is reasonable, but is based on new-build Tornado. The choice of prototype 60154 Bon Accord is therefore inaccurate. It comes in BR blue with crimson and cream coaches from the Railroad range. Even more interesting is the choice of it’s modern image companion, a Railroad class 47. This is a poor model. The choice of locomotive’s and the extraordinary high retail price do not make it a particularly attractive proposition, despite the advanced DCC system. I’d give this one a miss if I were you – if you want a set using the latest technology, save yourself money and buy R1173. This set and R1172 are somewhat revolutionary. 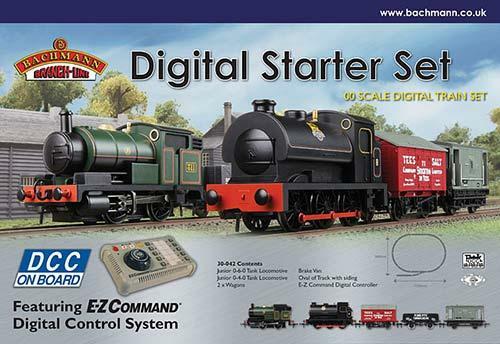 Unlike other digital set’s, rather than coming with a basic controller, they come with Hornby’s new e-link device and with Railmaster software. This allows you to control your trains from a PC, or even use a smartphone. It is very clever and although I’ve yet to test it myself, the reviews I’ve read have been fairly positive. It gives you potential to give you far more control than a conventional standard DCC controller. Note that you need a PC to work this properly! Unlike R1172, this set is much more reasonably priced. The Hornby 2721 class pannier tank is a low budget but decent model. The supplied trucks are basic, but fine for a beginner and you get a siding to play with too. So the contents are ok, the big thing however is that you get a very advanced DCC system to use and it’s pretty affordable. After all the Hornby-bashing of late, it’s good to see that they are nevertheless making strides to improve the model railway experience for the beginner as no other competitor is. This is the best digital train set you can buy, providing you can hook it up to a PC! 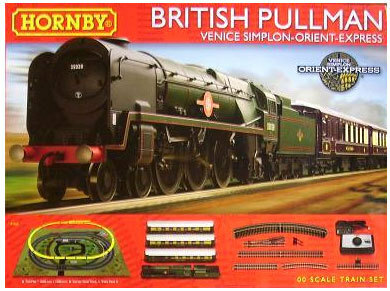 Fantastic quality contents, far better than standard equivalent Hornby train set models. It is an excellent value train set and the best reviewed here. Discontinued in 2013, but sets are still available in some stockists. This advice provided is based on logic, however liking a steam train is not always so! I’m sure there are many out there who would be happiest with receiving R1167 The Flying Scotsman or R1171 The Flight of the Mallard! However, think about the quality and price of these sets before you buy. 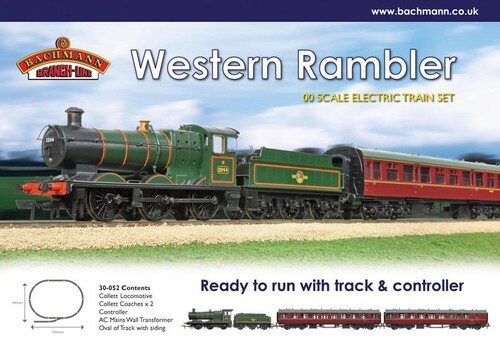 Last year, the clear message that came from the train set reviews was to go for the Bachmann branded boxes! In some ways the same is true and once again, Bachmann pave the way for analogue train sets, with 30-076/7 and 30-052 being excellent value. 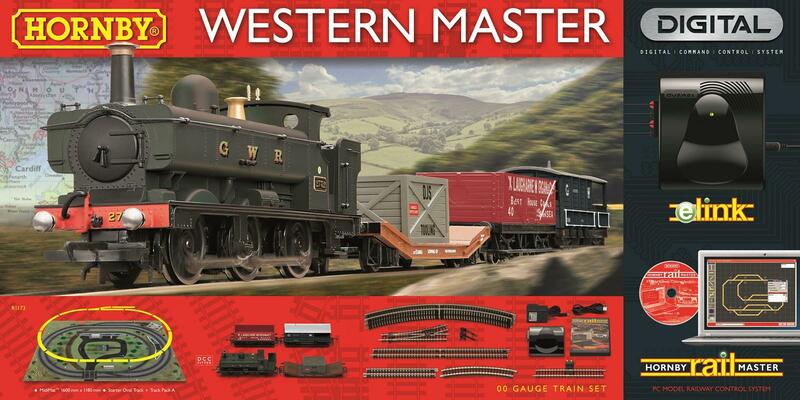 However, Hornby now lead the digital race with R1173 The Western Master. The new e-link system leapfrogs the Hornby digital system in front of Bachmann. It is very clever and offers playability way beyond the other systems available. Choosing a train set for yourself takes a lot of thought and for someone else even more so! Hornby R1173 The Western Master is excellent, but costs more than some people would want to pay. If you can’t afford this, go for Bachmann’s 0-076/7 or 30-052 for ages 10+. 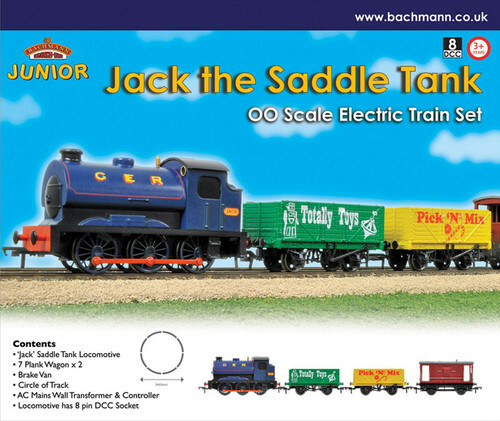 Younger children may be better going for the budget Bachmann 30-007 Jack the Saddle Tank. 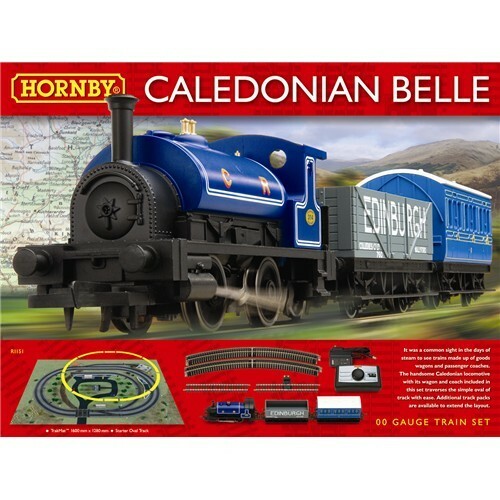 Also at the budget end of the market, but for older children is Hornby’s R1151 Caledonian Belle.